Learn how to create Pivot Tables quickly and easily with this step-by-step guide! In addition to the above, you will also learn how to create, format, and update a basic Dashboard using Pivot Table data. Including how to incorporate charts and performance symbols into your reporting. Imagine the time you'll save by not having to search the internet or help files to learn the most practical ways of using one of Microsoft® Excel’s® best features! Outstanding (5 stars) in print and Excellent (4 stars) on Kindle. Kindle came FREE with the print book (so don't buy in the wrong order! ), and the formatting, for a book about spreadsheets, is quite good compared to most others, where e-readers slaughter the content. There are some mis-spellings and a few bad page breaks, but not nearly as bad as the majority of numeric texts that make you page back and forth to see the illustrations. The didactics are also wonderful, even if you're a relative newbie to Excel. I'm discounting some of the online comments on this that say it is too difficult if you're just learning Excel, because who would buy a Pivot book who doesn't at least know the basics? That would be like trying to study Topology without ever having taken basic geometry. BUT you don't need THAT much background, just being able to define areas between A1 and I65, for example, is good enough. If you don't even know what a pull down menu (ribbon, dialog box, etc.) then this might be tougher. Some of the difficulty mentioned in reviews have nothing to do with this book, but with the fact that a user can go an entire career with just two dimensions in Excel. When you get to pivot tables, you start to work in three and more dimensions, with little "corner" pull down indicators to simulate 3D with 2D. A good first step analogy is simply organizing a bigger workbook with spreadsheet tabs; if you've done that, this will not be that tough. Educationally, this fits in a space between a YouTube that is too fast and far out to learn from and is simply some programmers vehicle to show off their ability, and one that is so basic you get bored with page filling fluff. The author, in effect, presents a "static" YouTube with this book, and in fact this text is an excellent more detailed guide to study before getting into more advanced features on Lynda or YouTube. As of this writing in mid 2018, the author's example workbooks and spreadsheets are still online and downloadable, unlike a few other Kindle titles whose online content have been deep sixed. 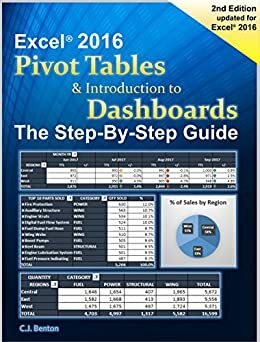 There's not as much on dashboards as I'd like, but to get an overview before reading this, I'd suggest a quick read of the Wikipedia article on Pivot Tables, which we've contributed to. 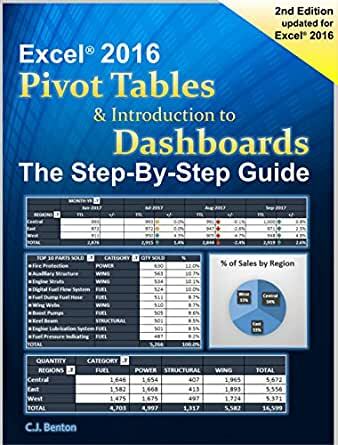 This will lead to the most basic dashboards (which are just pretty pivot tables) to very advanced topics like importing data from servers, big data, user GUIs, visual basic programming, and even way out there topics like creating Python pivots in numpy and with libraries. But for most of us mere mortals, this is a great beginning, to early intermediate, text. A lot of us will only use PT's to make easier ways to look at bigger reports. But this is non trivial also. For example Jack Welch, when CEO of GE, used to insist that divisional GMs (in effect CEOs) be able to present their entire business on one page. The "winners" (usually Engineers and not Graphic Artists!) used PTs to summarize huge amounts of underlying key ratios and facts. I also use techniques from the more advanced exercises in much more complex settings, like comparing deterministic to stochastic models in biomechanics, with fun topics like how swimming can be deterministic (like chess) whereas football is stochastic (like poker) due to the randomity of the ball! In real life, 90% of the exotic "big data" stuff really comes down to accounting (heavy sigh), but be calmed, it IS the language of business! Highly recommended as a beginning text, as long as you already know your way around the basics of Excel, and are willing to work the exercises, not just try to read it. Also works as a good reference. For more fun, read it with two screens, one for the text, one for the examples, and save some toggling! This author has a unique three bears talent for teaching, not too slow, not too fast, just right if you're willing to invest some effort. 3.0 out of 5 starsGood book but where are the example files? I purchased kindle version recently and really like the content and style of only giving steps but saving most of explanation, it saved my time in learning it. BUT I got a problem in download the example files, and cannot access the website (take long time trying to load but finally failed to). I also cannot find the author's email for me ask to send me the files by email (only a few and should not be large files)...That is only reason I give a 3 star ranking. I hope I can get help to resolve the file issues from other readers or the author or the publisher. 1.0 out of 5 starsBook??? Leaflet! Press the F1 key and you will have more information. It's a shame that some call themselves authors and offer such a hoax. Amazon should really be more careful on what they offer. Their beginning is entrenched on selling good and rare books out of a garage at affordable prices. Current site is plagued with titles like this one that do not contribute to knowledge, just to line a few pockets.